Today, my family and I live in Thailand; but for a little while, we called Australia home. The land down under has so much to offer. The giant island has diverse landscapes, white-sandy beaches, and unique wildlife. 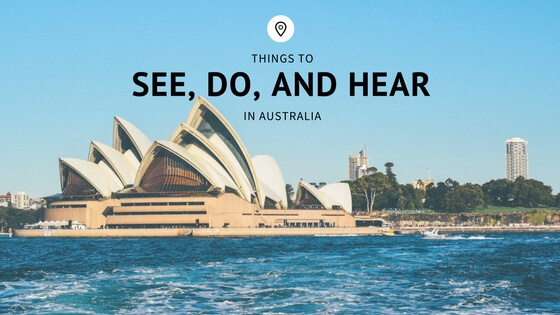 If you’re planning a trip, here are some of my favorite things to see, do, and hear in Australia. A short flight from either Melbourne or Adelaide will take you to Kangaroo Island. Many different native Australian species live in this sanctuary, including the tammar wallaby, southern brown bandicoot, and of course, the Kangaroo Island kangaroo, which is unique to the island. There are plenty of walking trails that have educational guides along the way. It’s a great trip with active little ones! When people think of Australia, often their first thought is either the kangaroos or the Sydney Harbour. And once you see the views Sydney has to offer at sunset; you won’t be surprised! There’s plenty to do here from the wide variety of restaurants and bars to the two, yes two, national parks. Take a walk around the Sydney Harbour Circle walk or if you’re a history buff like me, visit Fort Denison. If you have a bucket list of incredible sites to see in the world, make sure Uluru is on it. The summers can reach extremely high temperatures so plan your trip for cooler months if you wish to avoid 100+ degree weather. The spectacular sandstone rock is located in a remote desert, about a 4 and a half hour drive from Alice Springs. However, because of it’s large attraction, a town was built nearby for accommodation. A trip to the land down under wouldn’t be complete without seeing the Great Barrier Reef. No matter your experience with diving, you are sure to find an expedition that accommodates for beginners up to advanced, experienced divers. Explore the corals and see the many species who call this place home. If deep sea diving doesn’t catch your interest, you can also experience the Reef from the air by hot air balloon, helicopter, or plane. If you’re a thrill seeker, check out all the locations for skydiving as well.